Used Mercedes C-Class Review - 2007-2014 | What Car? 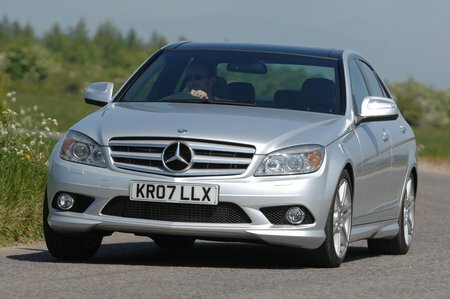 What's the used Mercedes C-Class saloon like? Although it's always been a competent car, the C-Class saloon has always been a little overshadowed by the BMW 3 Series. Such is the all-round completeness of that car that it's earned itself an almost iconic status, and the class it competes in, the compact executive one, has even come to be known by the car's name. However, don't write off the C-Class. With the introduction of this third-generation model, it actually became truly competitive with the BMW 3 Series. While the Mercedes still wasn’t as sharp to drive as the BMW, it compensated with a softer, gentler ride. In fact, the overriding impression of this version of the C-Class was one of comfort, even if the four-cylinder diesel engines could be disappointingly noisy. Head room is noticeably tighter in the rear seats than it is in the Audi A4 of the same era, but average-sized adults will still fit and the boot has enough room for a couple of big suitcases or golf bags. It’s worth buying as recent a C-Class as possible because the dashboard received significant styling, quality and equipment updates as the car aged. There were two significant updates: one in 2011 and another in 2013.